Summer is officially here! :o) Where I live summer weather is just for three months so we all like to soak up the summer time fun while it is here…it goes sooo fast. One of our favorite summer time things to do is cook on the grill. (Well, my husband likes to cook on the grill…we all love to eat the food he cooks on the grill…for some reason I am scared to cook on it!) 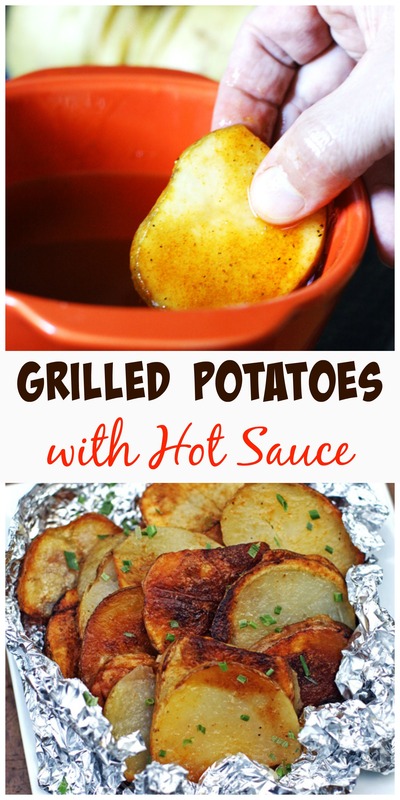 And one of our favorite side dishes made on the grill is this one for Grilled Potatoes with Hot Sauce. I don’t actually make this recipe, as the grilling is my husband’s department. So, I asked him to give me the recipe so I could share this with you. It is a very simple recipe that doesn’t take too long to make. We all want to enjoy the summer weather and not spend too much time in the kitchen, right? You just need to combine a few ingredients…one being hot sauce. My husband is a huge fan of hot sauce. He puts it on eggs, veggies and of course, these potatoes. I am not a fan of hot sauce, but am a huge fan of these potatoes! To make them, combine the olive oil, hot sauce, garlic powder and paprika in a small bowl. Dip each potato in the oil mixture until they are completely covered. Place the potatoes on the foil, making two rows. Leave extra foil at the ends so you can wrap it up and cover them completely. Stack potatoes two or three layers tall. 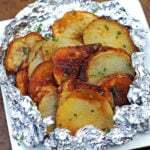 Wrap the foil around the potatoes, sealing in the oil mixture. Flip upside down and wrap again in another piece of foil to keep in the oil and potatoes. Cook on the grill at 400 degrees for about 30-40 minutes, flipping halfway. You can sprinkle them with chives if you like…and enjoy them with a nice burger or chicken on the grill. I have another great potato recipe that you can either cook in your oven or on the grill… Oven Roasted Rosemary Potatoes. This recipe is another great side dish and uses fresh rosemary, which you might have growing in an herb pot. The last few summers we buy an herb pot from a local farmer. Rosemary is one we love to put in there just for this recipe! Happy summer! Wash potatoes and do not peel. Cut the potatoes into 1/8 -1/4” slices. Combine olive oil, hot sauce, garlic powder and paprika in a small bowl. 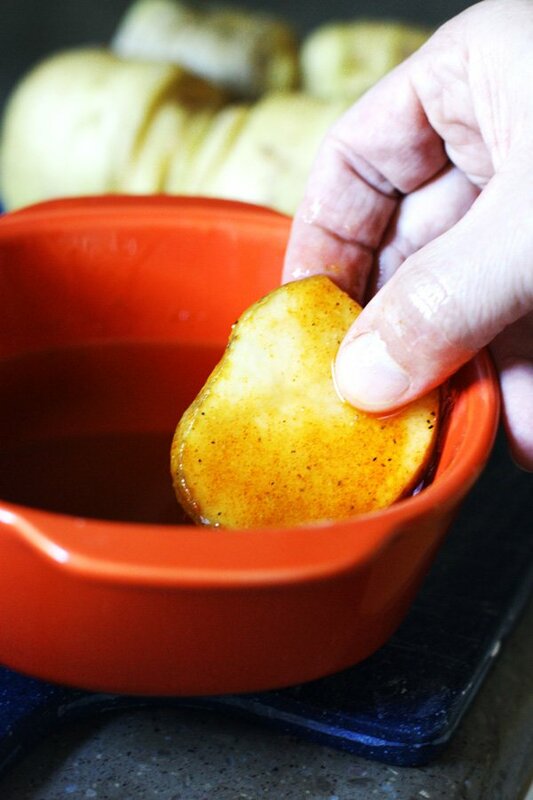 Dip each potato in the oil mixture until they are completely covered. Place the potatoes on the foil, making two rows. Leave extra foil at the ends so you can wrap it up and cover them completely. Stack potatoes two or three layers tall. 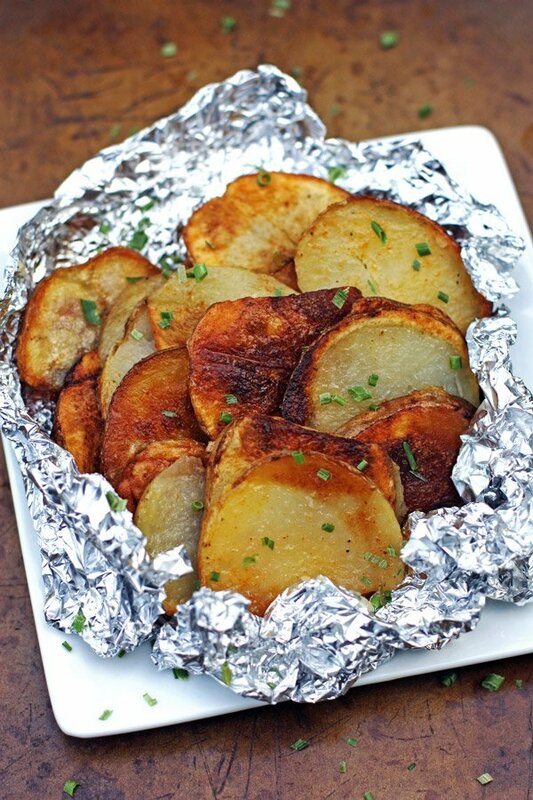 Wrap the foil around the potatoes, sealing in the oil mixture. Flip upside down and wrap again in another piece of foil to keep in the oil and potatoes. Cook on the grill at 400 degrees for about 30-40 minutes, flipping halfway.